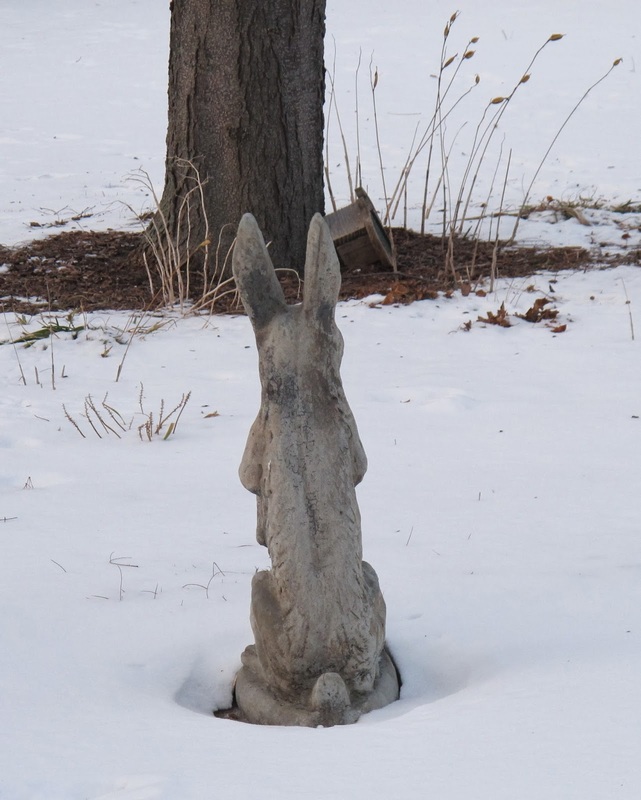 The rabbit is watching & waiting. We are garden fairies and we have been watching this blog, waiting for a new post. Waiting. And waiting. And waiting some more. Finally, we have decided to take matters into our own hands and Save This Blog from oblivion by posting something here at the beginning of the week. What has been going on here at May Dreams Gardens? We are glad you asked. It has been pretty much non-stop winter here. Snow, ice, wind, chilling cold, and did we mention slush? We garden fairies have been watching Carol cope with it all and have made some observations. For whatever reason, Carol has three different coats, multiple pairs of gloves and several different types of footwear for winter. Everyday, based on the weather, she decides which coat, which pair of gloves and which footwear to wear. The number of combinations is beyond our ciphering abilities, but somehow, she figures it all out and manages to go out and about it each day. We garden fairies, on the other hand, are content to stay indoors. We hang out amongst the house plants, for the most part, though sometimes we sneak into the kitchen to see what the toast fairies are up to. For our evening entertainment, we watch Carol look at seed catalogs, then when she isn't looking, we change up what she has marked. Won't she be surprised when she finally orders her seeds? We garden fairies are curious about one thing, though. Carol is expecting a package, perhaps on Monday. She is excited about it, whatever it is, but has been keeping her cool. Or she thinks she's keeping her cool. But we know better. She set up alerts to go to her phone so she can track this package every step on its journey to her door step. But what is in this package? We are garden fairies and we are quite curious. We can hardly wait for it to get here and for Carol to open it. Until then, though, we are going to just continue chilling, literally and figuratively, here at May Dreams Gardens while wait for the first snowdrops to bloom. I hope you don't freeze like the bunny. Take care in this weathers. Suspense! How early does the mail arrive? I hope it isn't an amazon anticipatory order shipment. Amazon may turn out to be as much trouble as the garden fairies. It has been relentless! Stay warm and pray for Spring! Dear Garden Fairies, I fear you are spending too much time watching and hanging around, and not enough time using those powers of yours to hasten Spring and banish the snow.I urge you to resume your duties without delay, lest this winter remain for ever. Dear Garden Fairies, it appears you have an unruly Gremlin in your midst, causing this post to appear many times, instead of the once, which was intended! !